Disney's "Muppets Most Wanted" takes the entire Muppets gang on a global tour, selling out grand theaters in some of Europe's most exciting destinations, including Berlin, Madrid and London. But mayhem follows the Muppets overseas, as they find themselves unwittingly entangled in an international crime caper headed by Constantine—the World's Number One Criminal and a dead ringer for Kermit—and his dastardly sidekick Dominic, aka Number Two, portrayed by Ricky Gervais. The film stars Tina Fey as Nadya, a feisty prison guard, and Ty Burrell as Interpol agent Jean Pierre Napoleon. 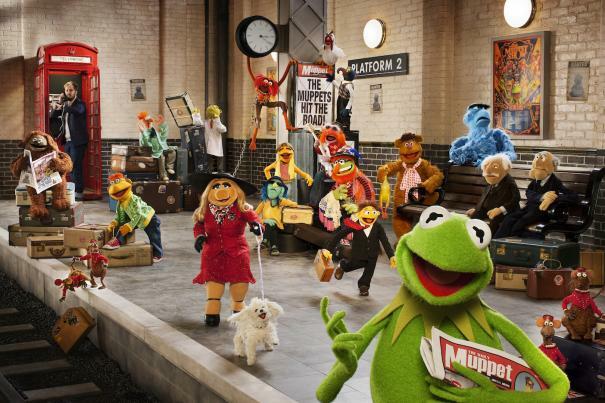 Disney's "Muppets Most Wanted" is directed by James Bobin and produced by David Hoberman and Todd Lieberman. Bobin co-wrote the screenplay with Nicholas Stoller, who is also executive producer with John Scotti. Featuring music from Academy Award®-winning songwriter Bret McKenzie, ""Muppets Most Wanted"" hits the big screen March 21, 2014.